It is about C H I C K E N.
I did not eat chicken for nearly 10 years. I was not a vegetarian nor under any religious restriction but there was a reason. My grandparents lived in a big traditional Korean style house with a large front courtyard with a garden and a common area. They also had several small houses attached to this courtyard for their tenants. Ever since that moment I did not eat chicken. I just couldn’t… until I was 18 years old. So, how did I get to eat chicken again? Well, it was the KFC, the Kentucky Fried Chicken! I grew up, finished high school and went to college in Seoul. My friend took me to KFC for lunch. I never tasted KFC before (I was from a small town where western fast food was not existent at that time). I, the first time in almost 10 years, tasted chicken. 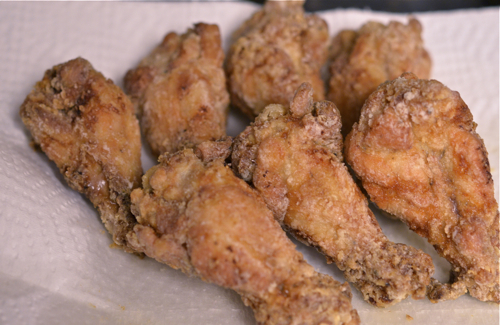 The first bite of those greasy, salty, and slightly crispy fried chicken? Well.., it was a moment of enlightenment. My, oh, my! What have I been missing all these years? I never imagined chicken could taste so good. I am sharing with you a special recipe for KFC, not the Kentucky version. It is the other KFC, the Korean Fried Chicken. 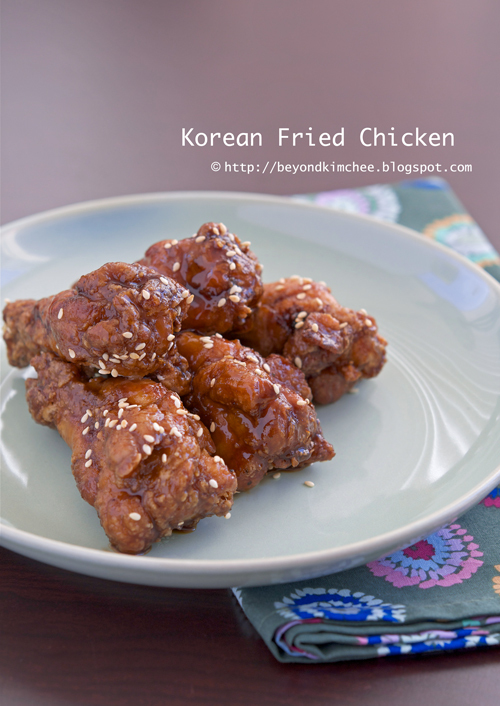 If you ever travel in Korea you should try the famous Korean fried chicken franchise called “Gyochon Chicken”. Their chicken is very popular among Koreans. When I visited NYC a few weeks ago I found the similar chicken restaurant called “Bonchon” near 7th ave and 38th street. Their chickens are very tasty as well. Honestly if you ever try the Korean Fried Chicken, You won’t like the Buffalo wings anymore. Of course I can not hack the secret recipe for both restaurants, but tried to imitate the flavor. And guess what? I think I came quite close to match. I like to remove extra skin on the chicken. The skin adds nothing but fat. It only takes extra 10 minutes of your life but it might prolong your life 10 days longer. 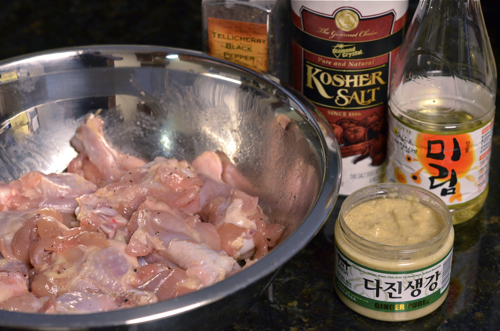 Combine chicken with rice wine, pureed ginger, salt and pepper. Let them chill for 30 minutes. 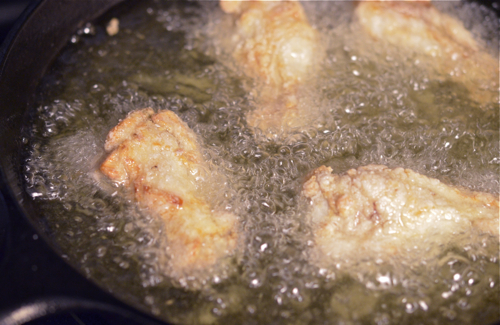 This will not only season the chicken but get rid of unpleasant poultry odor when frying. Meanwhile, grate the radish. This is the key ingredient in the sauce, so do not skip. 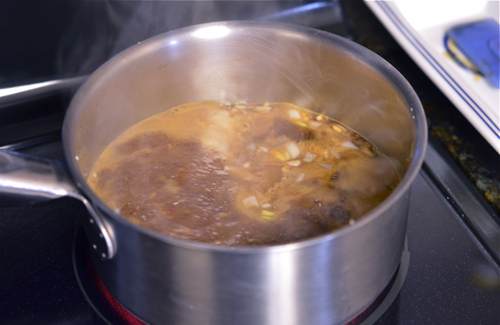 Bring the sauce to boil first and simmer over low heat for 20 minutes, uncovered. It will get thicken eventually. Strain the sauce through a mesh. Press gently to get all the flavors out. A beautiful glaze left behind. It will thicken more as it cools. Your chicken wings are cold without their coats. So, cover them with some corn starch in a bag. Shake them, babe! Shake, shake, shake! Heat oil to 170ºC. Drop your wings without any mercy. I sent one wing straight to heaven by putting into my mouth right away. But with the sauce… What can I say more? 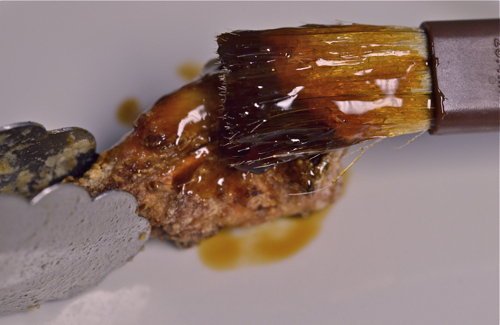 Brush the sauce all over the wings. Sorry, camera shake! It was so good that I was dancing with a joy. and cold soda to go with them. Pray before the bed time. Your chicken may appear in your dream and ask for his lost wings. In a large bowl toss chicken pieces with rice wine, salt, pepper, and ginger. Chill for 30 minutes. 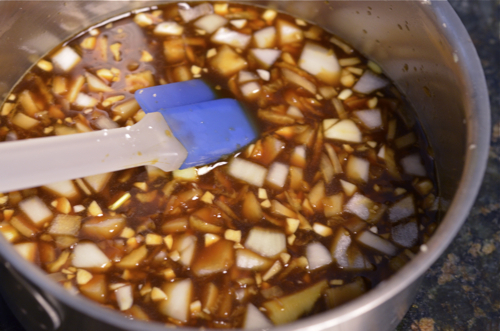 Meanwhile combine all the sauce ingredients in a small pot, bring to boil, reduce heat to low and let it simmer for 20 minutes, uncovered. 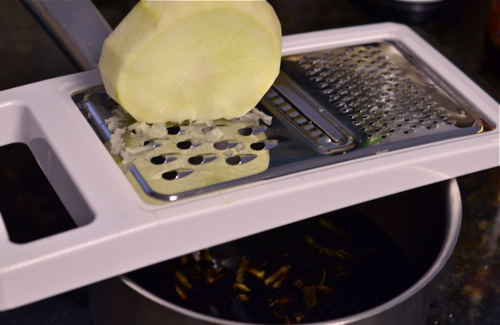 Place a mesh strainer in a small bowl and strain the sauce pressing to get all the juices out. Discard the stuff in the mesh. 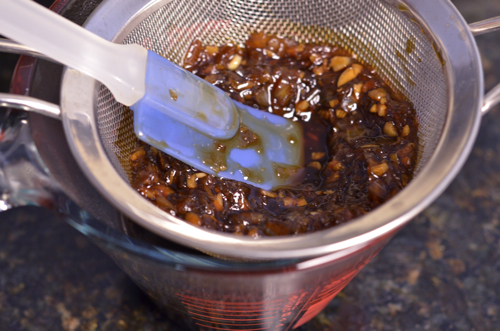 Your sauce will look like a glaze and will get thicken more as you let it sit. Warm up the sauce when ready to use. 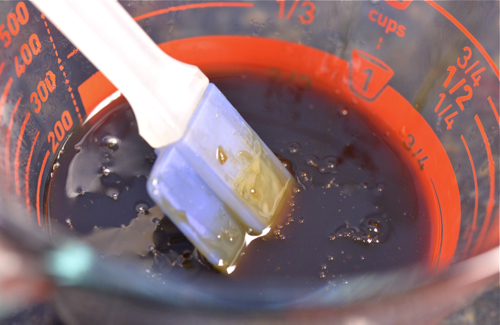 When ready to fry, Heat oil to 170ºC. 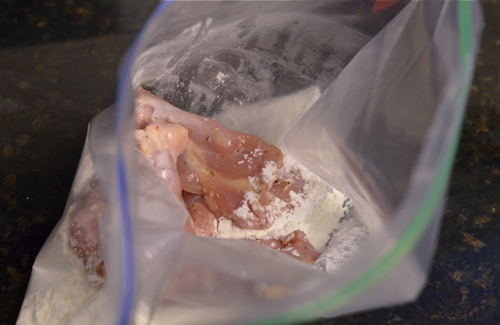 Toss the chicken pieces in a plastic bag with corn starch to coat evenly. 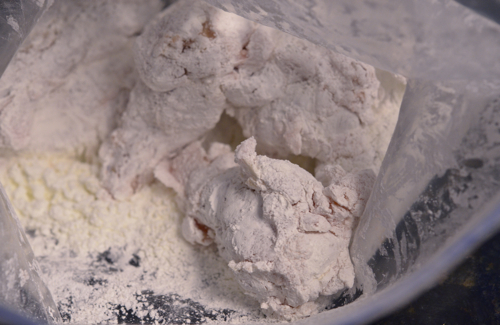 Shake off excess corn starch from the chicken. Drop chicken pieces in the hot oil and fry for 3-4 minutes until slightly golden (Do this in separate batches so you don't crowd the pan). When last batches are fried, drop first batches in the hot oil again for second frying, about 3 minutes until nicely golden brown. 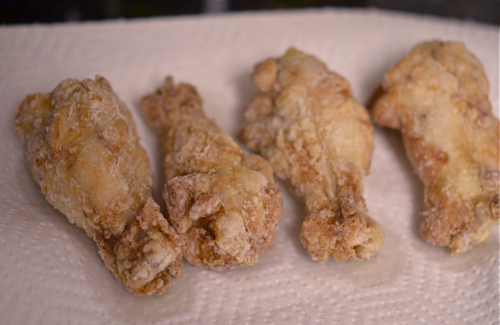 Continue the other batches and fry all the chickens pieces twice. This will help chicken very crisp. 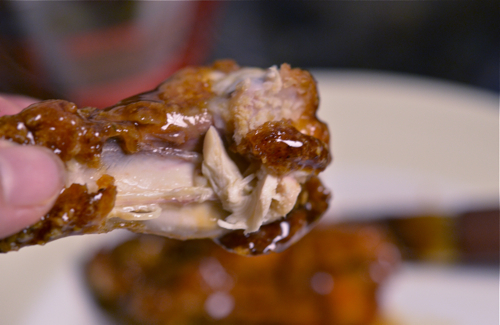 Brush warm sauce over hot chicken and serve immediately. I don't print your recipes but I love your site. It is beautiful. I am excited for the day when I'll have enough time to make some your recipes. I've been seeing a lot of KFC around lately. Time to make some! I didn't know there is Gyochon chicken in Anandale. I better look for it. Yes, it was common practice in olden time. I glad that I've never seen how people do with cow or other animal. Otherwise I wouldn't be able to eat any of them. Thanks Becky. Hope you will find some time to explore in cooking. It is fun and satisfying. Oh.my.goodness. That looks SO good! Thanks for your great chicken story. Whenever we go to the wet markets, I make sure my kids don't go near the butcher stalls, just in case someone ordered a fresh chicken "to go." Thanks. Hope you and your wife like this version of KFC. Please let me know if you have questions regarding any recipes. I can't wait until the spicy version comes out! I just printed this one! Oooh, I can't wait to try this recipe!! I think I will use chicken wings as well, I love chicken skin! I am going to Korea in April to visit my friend and I will make sure she takes me to try Korean Fried Chicken!! Have lots of fun in Korea. Yes, make sure your friend takes you to the chicken restaurant. April is a beautiful time to visit especially if you go to south you will see lots of cherry blossom. I have noticed that if you remove skin from the chicken, it doesn't soak up much oil when deep frying. Of course baking will be much healthier option, though, in any case. Let me know how it turned out. Thanks for the comment. I hope you enjoy. Hi Holly, always take a peek on your blog but never really leave comments, but right now I can't help but to comment that I adore your sense of humor... the chicken looks sooo delish! haha I adore your sense of humor! it's always a good idea to pray before bed.. oh, the chicken looks YUMMY! Holly, this recipe is OMG OMG OMG! Oh my god, it is delicious!! I tried this last night and the flavours of that sauce and the crunchy chicken is so so good! A real winner!! Thanks again so much! ps: my bf's uncle's gf also brought back some korean chilli flakes, ground shrimp powder and ground shitake powder which i used to flavour a soup i made and it made the soup taste so good! you were right about the shrimp powder! I am glad that it turned out so good. Yes, I use shrimp powder very often for pretty much for any vegetable dishes or soups. Shitake powder is also very good for soups and stir fries as well. I am glad that you got them. Time for some serious Korean cooking in your kitchen! Hi! As requested, I am informing you that I will be trying this recipe when I return to the States. Its a lot easier to get those more obscure ingredients when you can, you know, read the labels (I'm in Denmark now. Shopping = impossible) But this looks delicious! I just found your site and I will be back. I love the photos of food products in the packaging. We have excellent Korean markets in my town but when I go I find all the brands and forms of the same food item bewildering - for example chili sauce and paste. There are literally dozens and dozens. Thank you for the wonderful site. I'll write again if I attempt anything. For now, I love reading. Thanks for stopping by. It is nice to hear that you liked my posting. Yes, there are many options in choosing Korean sauces and pastes. A tip I can give you besides the brand name is to look for the label, "product of Korea" or "100%". Usually it means that the product is using 100% of specific Korean ingredients which is always better. Let me know if you have any question regarding any recipes. I'm so glad I found your site! I'm gonna try the Korean Fried Chicken tomorrow. I was wondering if you have the recipe for dak-hanmari? Its my husband's favorite dish and I'm hoping to cook it right. I did it once and somehow it tasted off. Many thanks and I love your site! Thanks for sharing! 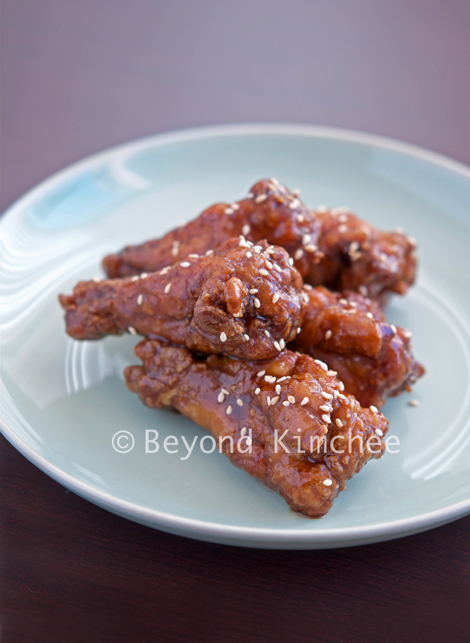 I hope you liked the Korean fried chicken, if you already made. Dak-hanmari is not quite the name of the recipe actually. The name started in local restaurant in Seoul with their menu. It means "one whole chicken". Basically they cook the whole cut up chicken pieces in the broth and eat with sauce, plus cook noodles and rice cakes in the same broth later on. It is good, of course. I will post it some day when I can. I love your chicken story. So funny and very well written. Lucky for us you started eating chicken again! I'm printing this recipe and trying it out for Superbowl Sunday! Looks delicious, thanks! I've been following your blog for a while now. I wanted to thank you for being so generous & sharing all of your recipes. The pictures & descriptions of every recipe brings back so many wonderful memories of my childhood. Your recipes have been brilliant for solving that problem. There are a lot of dishes I've never learned how to make so I'm building on my foundation of hankook yohree skills. I'll definitely be back on a regular basis to read more of your wonderful stories & enjoy the delicious pictures! Yes, Jienee, I know that "a little bit of this and a little bit of that" is the way people share their recipes in Korea. But sometimes I found that it is easier to say, or even makes more sense, because everyone's taste preference is different and Korean recipes are very flexible depends on personal taste. 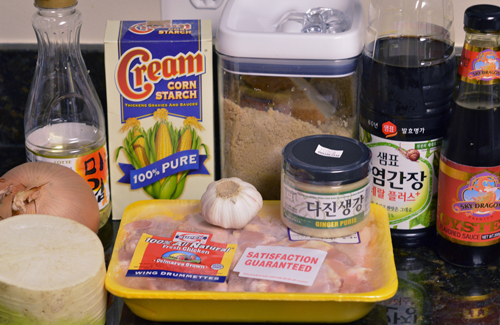 However for the beginners in Korean cooking it is helpful to get an idea how much each ingredients are needed. Thanks for loving my blog and hope you to hear from you again. Yeah! Hope you like it. Thanks. Printing this to make for my not-so-adventurous family... sounds like a nice way to branch out! Looks delicious! That looks so incredibly delicious. I'm going to have to try this recipe out. I've been trying to branch out and try Korean recipes lately. Not always going well. I'm Portuguese by decent and the cooking style is different from what I was brought up in. But this recipe is definitely some thing I think can try with out screwing up. Thanks for sharing! I really do hope this recipe turns out good for you. I love Portuguese food, too. I have tried a few times in Macau, but never tried to make at home. So I totally understand how you feel making food from very different culture. I'm excited to make this for a party! Do you have any suggestions for side dishes to go with it? Typically We serve with pickled cucumber or radish in Korea. I think any coleslaw will be wonderful accompaniment as well. Try my apple coleslaw. http://www.beyondkimchee.com/apple-coleslaw/ Hope you enjoy the chicken! Annyeong ha sae yo! It was delicious! My mum made it for me and it was wonderful to end the stressy school week! The recipe is great! Kamsahaeyo, Feather Stone. Hi Holly The KFC looks delish! Are we able to bake it instead? If so, how should I go about it? (sorry, not very good at cooking but would certainly like to try your recipe). Tks! I think you can bake. After you coat the hiken with corn starch, spray with some oil spray for a crisp texture. You might need to turn the chicken to the other side and spray again during the baking. I can't guarantee the flavor, though. As you know fat makes the flavor. After baked, you can brush with the sauce.